MedWise Insurance Advocacy—the Remedy for Medical Insurance Issues Including Denied insurance Claims, Medical Insurance Pre-authorizations, Medical Letters of Appeal, Medical Lien Claims, Understanding Explanation of Benefits and more. Are you overwhelmed trying to understand your medical bills? Do you have difficulty tracking your health insurance claims? Did you get a medical bill for something you did not expect because you did not have proper pre-authorization? 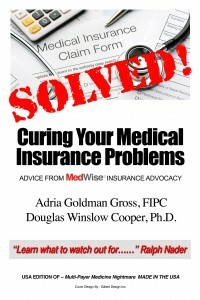 Relax–MedWise Insurance Advocacy is here to help. MedWise Insurance Advocacy works with individuals throughout the United States to help them understand and monitor their health insurance claims and medical expense reimbursements. We assist you in recouping the medical expense reimbursements you deserve. We will even review your health insurance policy and look for procedures that require pre-authorizations, to help you avoid needlessly stressful medical expenses and nasty surprises with your health insurance coverage. As experts in medical insurance advocacy and claims management, we audit and analyze medical fees on your health insurance claims. We work closely with patients and their loved ones to wade through medical bills and explanations of benefits (EOBs) to help you understand your benefits coverage, . . . and make sure you are receiving the medical expense coverage you are paying for! Save time and reduce stress handling your health insurance claims. Decompress while we provide optimal results assessing your medical charges. Avoid the annoyance of comprehending your explanations of benefits and medical bills, or keeping the paperwork organized and matched together correctly (payments with proper EOBs, matched with corresponding bills). Quickly understand your actual out-of-pocket healthcare costs and gain insight into your health insurance coverage. See better results in terms of medical insurance reimbursements. Experience more efficient medical claims processing. You have enough to worry about when it concerns your health. Isn’t it time you trusted a licensed medical insurance consultant and advocate to investigate your medical fees and probe the insurance company about your claims, medical bills, explanation of benefits, medical insurance pre-authorizations, denied insurance claims, and medical letters of appeal? Simply provide us with your health insurance claims and we’ll get to work right away as the professional liaison between you, the insurance company, and your medical providers. A professional who works with seniors referred a case to MedWise Insurance Advocacy at a time when patients and their families need support the most. A woman’s father was at the end of his life and ready for hospice care. However, he had a Medicare Advantage plan and was not a direct Medicare patient. Unfortunately, due to the nature of his particular plan, the hospital could not place the patient in hospice because his Medicare Advantage Plan did not cover hospice care (the basic Medicare coverage does include hospice). MedWise Insurance Advocacy stepped in to help effect the switch from Medicare Advantage to Medicare so that the patient would receive coverage for hospice care, saving the family many thousands of dollars in expenses . . . and countless hours of frustration dealing with health insurance matters at a most difficult time. A gentleman fell off his wheelchair in a restaurant that claimed it was handicap accessible but had inadequate accommodations for wheelchair-bound patrons. This person wound up in the hospital twice after that for treatment. He initiated a lawsuit against the restaurant and as the court date approached, he found himself inundated with piles of medical bills. That’s when MedWise Insurance Advocacy stepped in. Medicare was seeking $106,000 in reimbursements from the plaintiff on treatments it had covered if he won his case; therefore it was crucial that he discern which bills and medical expenses were directly related to his case, unrelated, and questionable in order to proceed. Ms. Gross sorted all the bills, tracked them against the explanations of benefits, and immediately took off $60,000 from the figure sought by Medicare by finding unrelated bills. In the “questionable” pile was another $31,000 that was determined to be unrelated. Out of all those bills, the gentleman only had to pay $15,000.